Germs are everywhere. Unfortunately, the chemicals for killing these germs may serve to make some of them even stronger. 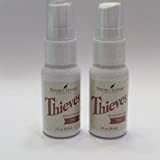 Thieves’ oil is a mix developed to help protect from the effects of the black plague, made with some of the best germ-killing essential oils available. It can be a natural alternative to treating wounds or disinfecting your home. A few drops of thieves oil in your water or favorite herbal tea can help fight off all the sicknesses that come around in the winter time. You can also add a few drops to a carrier oil to use as a homemade hand sanitizer without the drying of alcohol. Inhalation of a thieves oil diffusion can help stop bacteria before it has a chance to cause sickness and may even prevent bacteria growth on surfaces where the mist lands. Add 10 drops to distilled water to create a disinfecting spray to help stop the spread of illness in your home or office. Create a cleansing spray using 10-20 drops of thieves’ oil with distilled water. Spray directly on surfaces like tables, doorknobs, or even countertops where you are most likely to find germs. Using it with aloe vera gel and witch hazel will make an effective homemade hand sanitizer that can be used more frequently than alcohol based ones. Many essential oils assist with pain management primarily by offering anti-inflammatory effects. Clove oil does not only soothe inflammation, but it is also a topical analgesic, especially for mouth pain. (7) Eucalyptus has been used to the same effect. They can have the same topical numbing effect as benzocaine. Rosemary has been shown to relieve stress, so this can also assist with lessening pain. With clove and lemon adding to the antiseptic properties, you can use thieves’ oil directly on a wound to stop the pain or mix it with a carrier oil to massage into larger areas of the body. Diffusing thieves’ oil in the air can help with headaches and other body aches. Anyone with kids knows that germs are everywhere and you can never clean enough to catch everything. When they play with their friends, they bring it home, when they go to their sports, they bring it home. And there aren’t enough sinks in the world to wash their hands as often as they should. Years ago, I would have agreed with most parents about a squirt of hand sanitizer doing the job in place of washing. However, in the wake of resistant germs and a bout of dry skin that had my child’s hands cracked and bleeding from the alcohol in the sanitizer, I’ve turned to alcohol-free alternatives to keep clean between washings. I use a mix of witch hazel, glycerin, almond oil, and thieves’ oil to make a hand sanitizer that won’t dry out the skin but has all the benefits of killing off even those resistant bacteria. I re-used those little bottles that come with the silicone cases to hang on purses and backpacks. Now, my child has his own to take with him, and his hands no longer crack and bleed from overusing alcohol-based products. I have one strapped to my purse for walking around stores where people sneeze (into their hands) and then have to touch doorknobs to exit. Come cold season, thieves’ oil is one of the first things to go into the diffuser. Plus, the clove and cinnamon combination reminds me of the holidays. A couple drops of peppermint besides and it almost smells like Christmas. About 20 drops added to distilled water makes a spray to kill germs in the air and to wipe down surfaces that are touched by hands frequently like doorknobs and computer keyboards. Just about every things gets scrubbed to within in an inch of its life during cold and flu season. This kit has what you’ll need to begin making your home as germ-free as possible. It comes with a pre-mixed cleaning formula that you can mix with your favorite diluting base and start cleaning. You can use it with water or even with a natural alcohol like vodka. This kit includes foaming hand soap for your family to use in the bathroom. A small spray bottle is also included, so you can take your germ killing thieves’ oil formula on the go. Spray it in cars or even on the seats of a plane to protect yourself from germs while you travel. As a lozenge, you get all the germ-killing benefits of the essential oils without having to mix any in your water or tea. Eucalyptus and clove are natural topical analgesics so they will help to numb the pain of a dry, scratchy throat while the menthol can help clear sinuses and ease sinus pain. Using thieves’ oil in a lozenge form is also an easy way to take it with you since it can fit in a pocket or a purse. You can pop one in your mouth when you’re traveling, which may be especially helpful if traveling by plane. You know that your own house is as clean as you can get it but that’s a little more difficult when you have to travel. With a bottle small enough to be taken on a plane with your carry-on luggage, you can take your germ-fighting thieves’ oil on the go. You can spray it in your car when traveling with family or even on seats if you are flying to your destination. However, it has the added ingredient of denatured alcohol to help it evaporate in the air and on surfaces so save it for that and not your body. Clove oil may slow blood clotting so discontinue use before surgeries. Do not take orally if already on an anticoagulant. Always dilute in oil or water to prevent side effects from ingredient oils. Eucalyptus and cinnamon may decrease blood sugar; people with diabetes should watch blood sugar levels. Cinnamon may lower blood pressure; consult a doctor if taking medications for hypertension. Do not use if allergic to aspirin as the rosemary oil contains a similar chemical. Do not ingest oil if pregnant or nursing as rosemary can cause uterine bleeding. Tea tree and rosemary oil may cause seizures in people with epilepsy. Lemon oil can cause photosensitivity when applied topically, be sure to use sunscreen to prevent burns. By themselves, essential oils have the ability to kill germs and help improve your health. 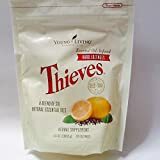 Thieves’ oil incorporates some the best oils with these properties, making it convenient for you and your family to keep healthy wherever you may be, without using chemicals which may add to the production of resistant bacteria. Please share with friends who are looking for more natural ways to keep themselves and their homes clean without the chemicals.